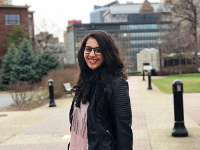 Zumi Mehta, a graduate student in the Graduate School of Pharmaceutical Sciences, was awarded the International Society For Pharmacoeconomics and Outcomes Research (ISPOR) Student Travel Grant to present her research work at ISPOR Europe 2018 in Barcelona, Spain. The award includes complimentary conference registration fees, registration for four short courses, and all travel-related reimbursements up to $1,300. "I am extremely excited to attend this conference and present all our work at an international platform," she said. "It's a one-of-its-kind opportunity, and I am grateful that the committee thought I am worthy of receiving this opportunity. I hope I can represent Duquesne at an international platform to the best of my capabilities. Lastly, this wouldn't have been possible with the constant support from my department and Graduate School of Pharmaceutical Sciences." Mehta and Dr. Khalid Kamal, professor of pharmaceutical administration, will present two posters at ISPOR, including a systematic literature review focusing on shared-decision making in oncology that was conducted over the last year. One of the posters titled, A systematic review of barriers and facilitators to participation in shared decision making in cancer care: an international perspective, has been selected as a semi-finalist for the research poster presentation award.